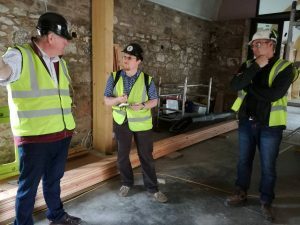 Yours truly in conversation with Drew and Gary at the construction site of Lindores Abbey Distillery. It was the year where for the first time I noticed something like fatigue. At times I couldn’t get myself to write a whisky review or think about a subject for an article – a feeling that grew worse and worse the more I got exposed to “luxury” and “collecting” in regards to whisky. That’s not why I got into whisky and these two aspects certainly dominate today. 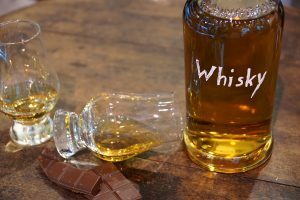 What’s the oldest whisky? What’s the most expensive whisky? Who gets the most celebrated celebrity to smile from the billboards for the sake of flogging booze. That’s not my whisky world and I’m tired of it. I know I might sound like a broken record by now – but there’s no denying and no hiding these feelings. All of this resulted in less activity – on the blog, on the social channels and, also, drinking whisky. I have made a conscious health choice to abandon the “daily dram” from my life, mostly in favour of good-quality loose-leaf tea, with a tea session in the evening being every bit as interesting and as demanding as enjoying a wee dram. At the same time, this has made the occasions (mostly weekends) when I do enjoy a glass of whisky even more enjoyable. It also saves quite a bit of money – and makes my existing stocks last longer, which is a very good thing. Right, enough doom and gloom, let’s take a look at the highlights! As always, these have to do with whisky people and experiences! From invitations by very dear friends (you know who you are) to an unforgettable two-week road trip to the Campbeltown Whisky festival, to Orkney and Fife – I had a blast! It’s hard to single out specific moments, but (besides the entire Campbeltown festival) one of the highlights was visiting the construction site of Lindores Abbey Distillery. The time spent with Drew and Gary was unscripted, passion-filled with no-marketing-BS. I wish all distillery tours were like this. Meeting friends old and new, sharing drams, beers, laughs and hugs, that’s what whisky is all about. Full Stop. Let me start the outlook for next year by continuing with the whisky and people theme: Next year’s Scotland trip is in the planning stage. It will see me return to Islay after a (too long!) absence of two years – but not for the festival. And, since we had such a blast this year in Campbeltown – we will be back next year! 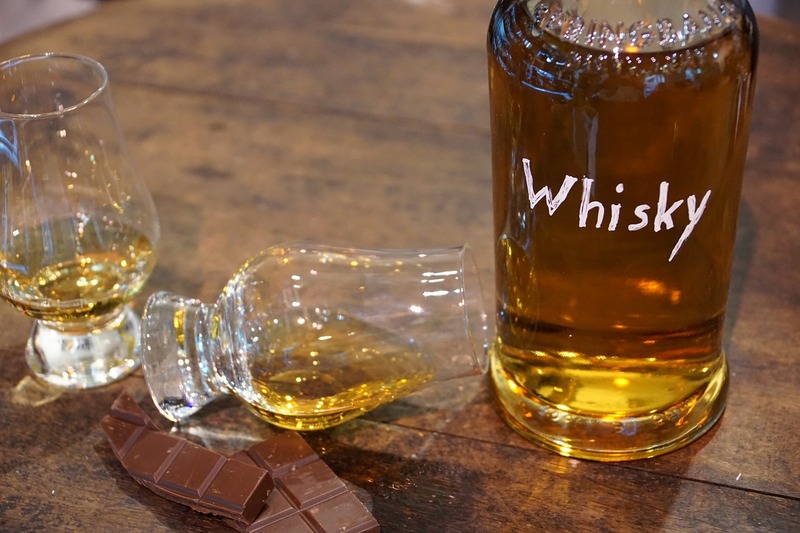 I’m also planning a trip to the Limburg whisky festival (first time!) which I’m very much looking forward to – mainly because of the whisky people. Personally I will take it easy in 2018 with the purchases. In part this will be very easy due to not having a Cadenhead’s store in my country anymore – that’s where 50% of my whisky business went these past years. I know I could theoretically buy these in other countries – but most of the whiskies aren’t important enough to warrant the hassle and added expense of getting them imported to Austria. I’m well-stocked, I’ll take it easy with the purchases. The blog will continue to be maintained and I will continue to write about what I think needs to be written about as well as publishing reviews – just not to the tune of two a week anymore. I am shifting my free time away from consuming to creating. As some of you may know I do quite a bit of traditional film photography and the time creating and printing pictures in the darkroom has grown to be an important factor in my life – a factor, which does take up a bit of time I have to reallocate from other areas/hobbies. As far as industry predictions are concerned, I meant it when I suggested in the introduction to just re-read what I wrote last year, it still holds true. Prices will go up, demand will go up, availability for the in-demand drams will be worse, yadda yadda yadda, you get the gist of it. The best whiskies of the year (in my humble opinion) were mainly drams which have by now sold out and are unavailable to most. Since I have made it my mission to only award whiskies which you as my readers have a chance of buying, there’s no point in doing so under these circumstances. But, if you really need to know, the Banff and Caperdonich bottled for Cadenhead’s 175th anniversary are high up on the list. (I know someone will point out whiskies I’ve given equal or higher scores, but these two got stuck in my head without cheating and looking back at everything I tasted, which has to say something, right?). As far as the daily dram of the year is concerned, I’ll do it differently this year. I have been approached by quite a few people looking for suggestions which won’t break the bank and are great value for money. So, instead of naming a single whisky, I am presenting you an (incomplete) list of more or less readily available drams in alphabetical order which I would wholeheartedly recommend to a friend looking for a quality bottle of (Scottish single malt) whisky at a good price (under or about 50€ here). All of these are whiskies I do/would buy for myself, so I have left out a few which would fit the bill but don’t match my personal taste! The links lead to the respective reviews/tasting notes on my site. Right – that’s all I have to say this year – slightly different than usual and I hope you enjoyed reading this piece – as well as my other ramblings and reviews throughout the year. Please also follow me on Twitter Instagram and Facebook (if – gasp – you don’t already do!). Cheers! Thanks to all the readers for your support in 2017 – here’s to a great, successful 2018 filled with great experiences, awesome people and drams that put a smile on your face! ooops the Bunna is in the list…. Ardbeg 10 is a solid choice – I have yet to try the Glendronach 12, but I keep hearing good things about it!